As preparations are made for planting the 2013 wheat crop, growers should consider how the 2012 drought might impact their fertilizer needs. There is a strong possibility that there will excess (carryover or residual) N in the soil profile after the 2012 corn crop is harvested because the corn was too affected by drought to use all of the applied N. If soybean is the previous crop, there is a low likelihood of excess N remaining in the soil profile. Regardless of previous crop, some of the P and K applied last year will be available for the wheat crop. In the fall of 1988 following a summer drought, 150 to 450 lb NO3-N/a were found in the soil profile after corn harvest at five locations around Wisconsin. At seven different locations, spring 1989 soil profile nitrate concentrations ranged from 98 to 406 lb N/a. These data clearly show that there may substantial amounts of excess N in the soil profile that could be used by wheat. Past research in Wisconsin has shown that wheat needs less N if fall preplant soil profile nitrate concentrations are over 50 lb N/a. This same research demonstrated that there was no good relationship between N response and profile nitrate concentrations in early spring. Based on our current wheat N response database, we have developed N recommendations that take into consideration soil texture, previous crop, preplant soil nitrate concentration and the price of N relative to the price of wheat. These N rate guidelines are shown in Table 1. The most profitable N application rate is the one that maximizes the return to N (MRTN) and is given in bold text. The N rates in gray text give the range of N rates that will produce profitability within $1/a of the MRTN rate. The N rates in Table 1 are based on a N:wheat price ratio of 0.05 (e.g. $0.40/lb N and $8/bu wheat). The revised UWEX publication A2809 (Nutrient application rate guidelines for field, vegetable, and fruit crops in Wisconsin), which will be released later this year, will contain additional N:wheat price ratios. 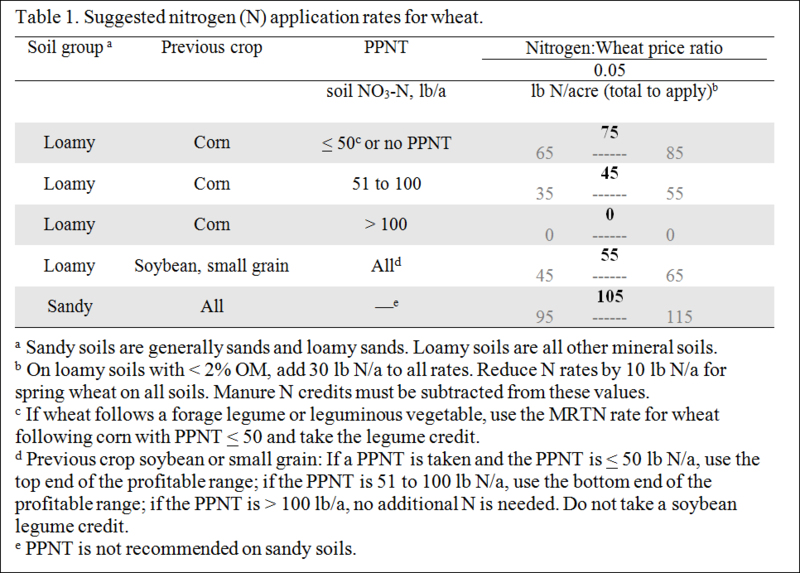 With the high potential for excess N in the soil profile following corn, growers are encouraged to take soil samples for the preplant nitrate test (PPNT) and use this information to help select a N rate for wheat. The PPNT is actually two soil samples: 0-1 foot and a 1-2 foot samples collected prior to planting wheat. Fifteen soil cores should be collected randomly from 20 acres. Sampling bad and very bad areas separately may be useful to assess variability within a field. In addition, areas with different soil characteristics and/or past management should be sampled separately. After collection samples should be kept cool becauae the nitrate content is moist soil samples stored under warm conditions can increase quickly and cause erroneous test results. If samples cannot be delivered to a soil testing lab within 1 to 2 days, the samples should be frozen or air-dried to prevent changes in nitrate concentration. It is likely that not all of the P and K fertilizer applied this past spring was used by the 2012 crop and will be available for the 2013 wheat crop. Thus, recommended P and K applications for wheat may be reduced. Take credit for unused P and K using the following formula. To maximize profitability, growers should strongly consider using the PPNT to select a N rate for wheat if the previous crop was corn in 2012. In addition, growers can improve profitability of their wheat crop by reducing P and K applications by the amount of unused P and K that was applied to any previous crop in 2012.